FILE - A man holds a token bearing the symbol of a cryptocurrency at his shop in Sandy, Utah. The tiny Marshall Islands is creating its own digital cryptocurrency in order to raise hard cash to pay bills and boost the economy. 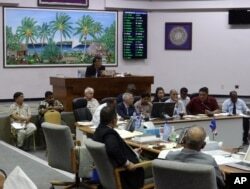 Lawmakers listen to people discuss the pros and cons of creating a digital currency, in Majuro, Marshall Islands, Feb. 23, 2018. The Marshall Islands is creating its own digital currency in order to raise some hard cash to pay bills and boost the economy. “The prices of many cryptocurrencies have exhibited the classic hallmarks of bubbles ... reliant in part on finding the greater fool,” Carney said in a speech to the Scottish Economics conference in Edinburgh.